Bubblegum Soup: Spin and twirl with The Rock Flowers! Spin and twirl with The Rock Flowers! "Spin My Record, Watch Me Twirl!" This week is a combination of a few of my favourite things; things such as Girl Groups, Bubblegum, Lost Gems...and Debra Clinger! Wahey! Man, if I was a doll collector as well ^__^ Haha! So yea, The Rock Flowers - whattatheyallabout? Well, in a long and indeed great tradition of toy and music markerting link-ups Mattel lauched a set of dolls to compete with the then popular Dawn dolls by rival firm Topper Corp. 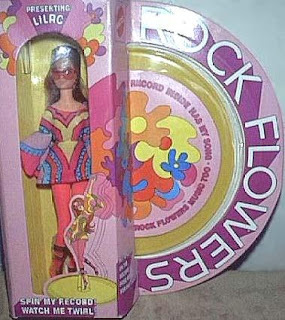 The Rock Flower then kinda melded their own niche, concentrating on a "hippy rocker" image together with a plastic single that came with each doll. They were produced en masse from about 1970/71 to 74 and were quite the popular girls on the block! 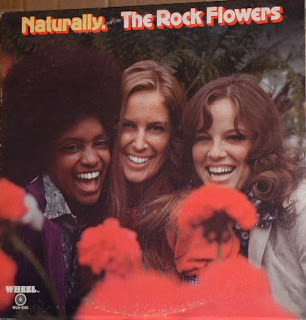 The original trio that made up the Rock Flowers Heather, Lilac and Rosemary but were also later joined by Iris and a certain Doug! 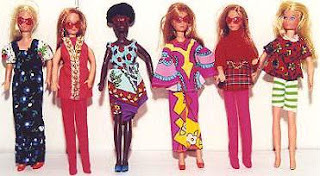 By 1974 the dream was over, and Mattel resorted to selling the remaing dolls minus record and shoes - funnny! Well I guess it complimented the hippy vibe! 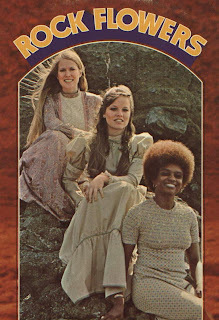 Now as well as the singles that came with each doll, 2 LP's were released consecutively in '71 and '72 featuring the vocal talents of Rindy Dunn, Debra Clinger and Ardie Tillman. What was stange about these LP's is that bearing in mind their issuing as part of a marketing masterplan, the only reference to the dolls was the name of the group itself! Anyhow the Lp's and singles are a utter fantastic collection of bubblegum girl sounds, with a bit 'o a rockin' edge! Produced by the man behind the Partride Family (Mr. Wes Farrell) and written by Toni Wine, Ellie Greenwich (brill!) and Carol Bayer. So great that Jeff Barry wrote for The Archies, and Ellie for The Rock Flowers! The girls went on to tour with Tom Jones before splitting. I will probably feature more of the wonderful Debra Clinger and her sisters in the future, but for now enjoy! The 2 seperate downloads below include the first self-titled LP and the second called Naturally as well as 4 more songs in addition! Which = 26 in total! Wahey! I Am the First Download! I Am the Second Download! Thanks for these lost gems! I've been looking for the Rock Flowers self titled album for years now and was happy to find it at your site, but i was disappointed that the link is dead. mp3s which I do post will only be available for dowloadings for a small amount of time, say a month? I will aim to try and post material not previously available in legit comps but if I do it is for the promotion of the artist. Please contact me if I infringe copyright which you hold. Anyhow thanks for looking and hope you find something interesting! Yutta Tutta with Vicky Baker! Jan McClellan and The Debutantes!